The 7.3 magnitude mainshock that struck Kumamoto prefecture on 16 April (Japan time) was preceded by a 6.5 magnitude earthquake and followed by more than 1000 aftershocks. Less a devastating head-on collision than the wheels falling off a truck at 60 MPH and the axles dragging along a road filled with potholes. Unlike the colossal magnitude 9 quake that devastated the Tohoku region of Northern Japan in 2011, the Kumamoto earthquake did not trigger a tsunami. Occurring in a largely rural part of Japan on the southern island of Kyushu, it has caused only 49 deaths to date. The most severe damage was from landslides. 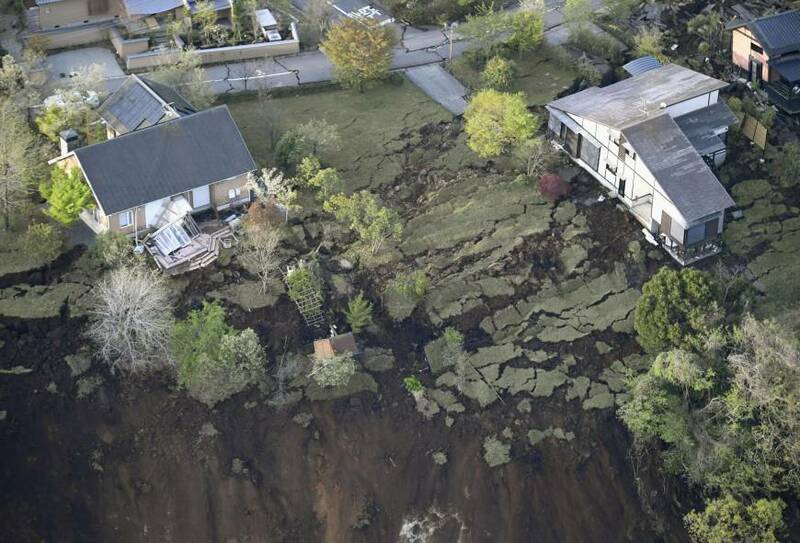 Not the edge of a cliff, a landslide (courtesy Japan Times). 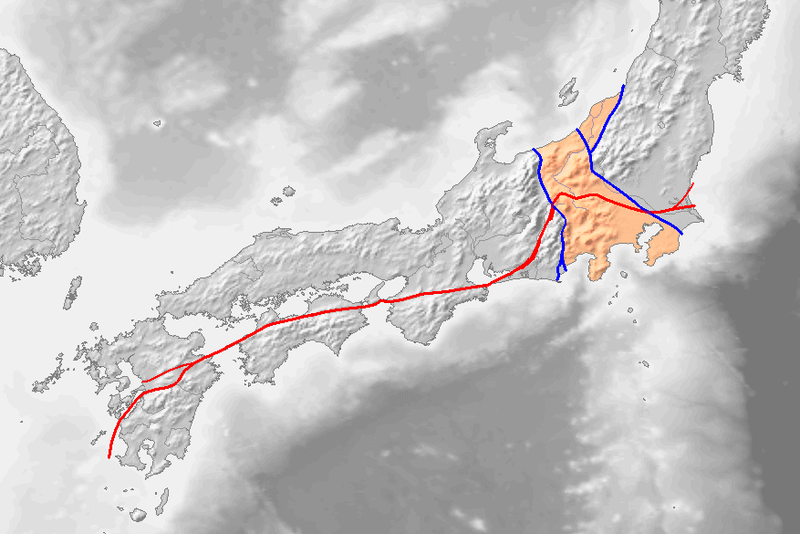 The earthquake struck along a shallow inland slip fault, specifically the Futagawa-Hinagu fault link, at the western edge of the Japan Median Tectonic Line. A slip fault vividly illustrated (courtesy Japan Times). 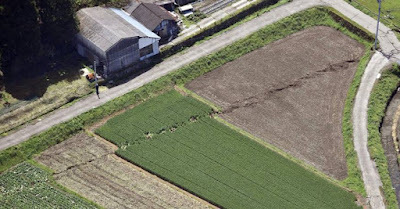 Like the San Andreas, the Japan Median Tectonic Line is clearly visible on topographical maps. 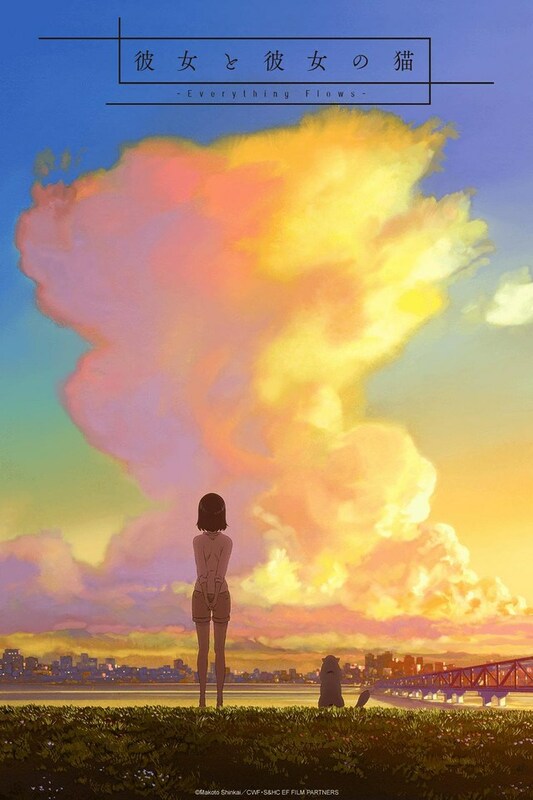 It begins its journey off the western coast of Kyushu, heads east-northeast, hugs the northern coast of Shikoku, bisects the Kii Peninsula, doglegs around Mt. Fuji, and plunges back into the ocean fifty miles east of Tokyo. To the north, the Philippine Sea Plate is colliding with the Pacific Plate and the Okhotsk Plate. Moving at a brisk 48-84 mm/year to the west-northwest, the Pacific Plate rams the southern edge of the Okhotsk Plate and the northern edge of the Philippine Sea Plate, crumpling the bedrock of central Japan into the Japan Alps. The collision between the Philippine Sea Plate and the Pacific Plate forms the Ogasawara Islands, that start at the Izu Peninsula and include Iwo Jima at its southern end. The Izu Peninsula sits at the feet of Mt. Fuji and is home to Hakone National Park and its countless hot springs—a mere 50 miles south of Tokyo. Sitting on top of the convergence of four massive tectonic plates, perhaps the most amazing thing about Tokyo is that it continues to exist at all. There's a lot to be said for the simplicity of Japanese grammar: no gender, no determiners, and no plurals. Well, aside from all the exceptions. And even the exceptions are pretty straightforward. But when it comes to counters and the dizzying array of honorifics, not so much. Honorifics may be linguistic leftovers from feudal times, but they are very much alive in the Japanese language today. Awareness of social rank is the glue that holds Japanese society together, and these ubiquitous noun suffixes are a key way of identifying the status of the person in question. Honorifics fall along a sociolinguistic arc from abstract class markers to literal professional titles. Keep in mind that when referring to a person with a higher status, the title becomes a pronoun. Imagine a press conference where the reporters started with "Mr. President" and never said "you." That's perfectly grammatical in Japanese. After first mention, dropping the subject from a sentence is perfectly grammatical too. Thanks to the spread of popular culture, people outside Japan are familiar with -san and -sensei. Equally common inside Japan are honorifics like -senshi ("player") for athletes and -anaunsaa ("announcer") for newsreaders and MCs. To be sure, an "honorific" doesn't always honor the person it's attached to. As the "innocent until proven guilty" thing never really caught on in Japan, a person arrested by the police can look forward to having the press attach -yougisha ("suspect") to his name until his case is adjudicated. However neutral -yougisha was intended to be, in the public mind it now means "guilty as hell" (a good example of the "euphemism treadmill"). 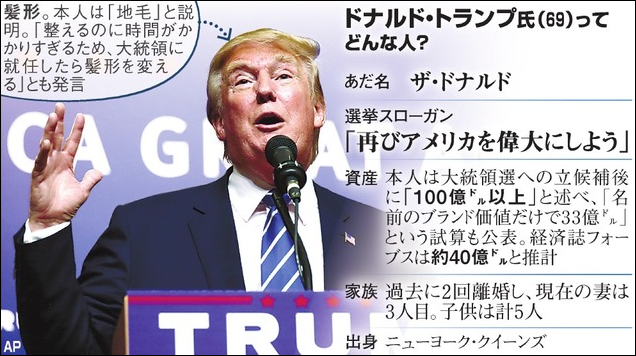 With the Japanese press covering the U.S. election season with great gusto, and the participants providing a lot of fodder for the mills of mass media, we're also hearing a good deal about Trump-shi. This particular honorific (氏) is applied to candidates for public office. 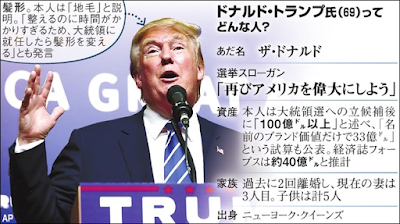 The Asahi explains "The Donald" (including his hair). It also identifies individuals who deserve a status higher than a mere -san but whose social rank isn't clear given the available context. This makes it a common substitution for -san in literary titles. Dr. Jekyll and Mr. Hyde, is usually translated as "Jekyll-hakushi and Hyde-shi." This flexibility makes it easy to swap in background information on the fly. Ben Carson is an M.D. (-sensei or -hakushi) but a -shi when running for office. Cruz, Rubio, and Sanders are generally labeled as -shi in screen captions and -jouin'giin ("senator") in reportorial commentary. And when a claim to fame is in the past? Bill Gates-shi is a former CEO (which, in Japanese, is "CEO"), plus the "former" prefix (moto-) makes him "Bill Gates 元CEO." Or for the more recent past, the zen (前) prefix. Bill Clinton is a moto-president while his wife is the zen-secretary of state. To the dismay of the Republican establishment, Trump-shi shows no signs of becoming a zen-candidate anytime soon. And even more worrisome, he could actually become Trump-daitouryou. "Mini-Super Tuesday" GOP results (Mainichi News). On a slow news day (sans an earthquake or explosion somewhere), two "international" topics have been getting equal coverage on NHK news programs this spring: U.S. presidential politics and Japanese players in Major League Baseball. And after every big primary, the former gets even more attention. Whatever the United States does is hugely important to Japan's national interests. Along with the sprawling navy base at Yokosuka, a whopping 20 percent of Okinawa's land mass is taken up by U.S. military bases (too much, frankly). But considering the local political geography, Japan knows that good fences (enforced by U.S. military muscle) make good neighbors. The Okinawans certainly don't like it, but the Japanese government won't be chanting, "Yankee, go home!" anytime soon. There's also the sheer weirdness value. This is a case of "American exceptionalism" that is literally that. Almost all democracies on the planet are governed by some sort of parliamentary system that effectively does away with these sorts of at-large elections and political free-for-alls (imagine if the president were elected by Congress). And yet I'm struck by how different the commentary isn't. Japanese news coverage proves that that the mass media echo chamber knows no boundaries. Whether inside-the-beltway or inside-the-Yamanote, the mindset is remarkably the same. "If it bleeds, it leads" is universal, and the nightly news in Tokyo could convince you that Japan is as violent a place as Detroit. Except that what you are seeing are reports distilled from a population of 130 million and condensed into a single broadcast. It's as if every news bureau on the planet has a crime and mayhem and Donald J. Trump quota to fill every evening. NHK likes illustrating stories about Trump with the least flattering stock photos on file. To be sure, Trump's inexplicable Japan-bashing is a tired relic from the 1980s. But NHK also plays up Trump's anti-immigration rhetoric as if it were shocking to the senses. Unmentioned is that (outliers like North Korea aside) Japan has the toughest immigration policies on the planet. Trump should boast that he's going to make America great again by implementing Japan's existing immigration laws, word for word. On the other hand, another unshakable truth about Japanese propriety is that, however unlikable, a notable public figure still gets an honorific if his status warrants it. So along with all the other candidates, it's Trump-shi. More about what that means next week.